Since it's been so long since I posted, thought I would run through some of the differences and things to note on them. I'm reposting both of them for comparison. Note that these are reduced to 33%. Click on the pictures to see them on Photobucket where you can click again and see them at 100% for much of the detail I will be discussing. Text slightly modified from the Osprey Combat Aircraft title. Following the US task force's strike against Shokaku and Zuikaku on 8 May, Lexington and Yorktown were attacked by squadrons from both Japanese carriers. Among eight VS-5 crews assigned to a low-level anti-torpedo aircraft patrol was Lt(jg) 'Swede' Vejtasa and his gunner. Radioman Frank Wood. In the ensuing wavetop melee, A6M2 Zeros shot down four scouts with all crews lost. Vejtasa flew his SB4U aggressively, offering only deflection shots to the fighters, and was credited with three destroyed - only one A6M actually ditched with battle damage. Vejtasa was awarded the Navy Cross and soon joined VF-10, where he won a second award for his interception of Japanese torpedo bombers at Santa Cruz in October 1942. I didn't want it to look like I just shifted some markings and called it "done", so I tweaked a number of things. The second (most recent) aircraft represents an aircraft a little later on the production line. As such, I gave it slightly brighter blue paint, slightly less weathering, a little different paint scheme (most noticeable around the horizontal stabilizer) that's more representative of the period scheme seen on Dauntlesses. Likewise, I made the shine ever so slightly brighter, since it should be a newer aircraft. The markings correspond to the profiles I've seen of Vejtasa's SBD from Coral Sea, but I've never seen an actual photo of the aircraft he flew in the battle, so I cannot verify any of them. As a later aircraft than 4537, I have it using the later yellow-only tips starting to be seen on USN prop blades at about that time. The paint chip pattern is different to keep things original, and Vejtasa's aircraft is depicted without LSO stripes but with the cowl number. One of the other things that I spent a good deal of time on was getting that darned oversize star right. I can't say that it's perfect, but I can sleep at night as it is now. Many profiles don't show it properly, as the wrap around the curved portions of the fuselage do warp it quite a bit. Finally, while also a Scout aircraft, Vejtasa's plane was one of the VS-5 pilots who attacked the IJN carrier Shōhō. 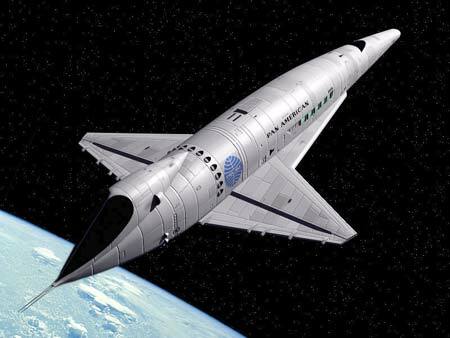 The profile actually depicts Vejtasa's aircraft on the way to the Shōhō, the day before his famous engagement with Zeros. From what I've read, the scout planes were largely armed with 500lb bombs, which is what I depict his plane carrying. Now, on MOST profiles, you'll see Dauntlesses carrying OD bombs. I can't find pictures of USN dive bombers from the time of Coral Sea and Midway that support this. The pictures that I see from that period generally show gray bombs. Prewar and very early war photos show high explosive bombs in their regulation yellow paint. I cannot take credit for this research, though I did try to independently verify it as well as I could. Tommy Thomason's blog post on the matter was my main source. Accordingly, I gave it a slightly rusty gray body with a pristine gray tail, roughly the same color as the aircraft underside. I hope you all enjoyed the comeback profile! Good to see you again. Your Viking is as stunning as ever. Nice one, Logan! Great to see you here! :in-love: Wow, awesome work Logan! Logan, great to have you aboard! I still find it incredible to believe there is a Stuka in there somewhere. Nicely done! The historical context is a nice complement to the illustrations. I was finally able to finish the one I've been working on for a while. Another recipient of the RAF's unwanted Vikings was the Soviet Union, the first aircraft arriving in the winter of 1941-42. The initial aircraft were Viking IIa variants. While the Viking II was basically a British SB4U, complete with naval gear, the Viking IIa was a switch to a land-based variant, cooler heads having prevailed regarding the aircraft's utility. It also didn't help that the FAA wasn't interested in any more of the RAF's aircraft, which meant there was little point in continuing the navalized aircraft charade. The delivered aircraft were roughly analagous to the USAAC's A-19B variant, incorporating many of the same upgrades that benefitted the SB4U-4, such as self-sealing fuel tanks and armor plating, yet lacking the folding wings. While not as heavily armored or as fast as the venerable Il-2 Sturmovik, it would really be unfair to make that comparison. 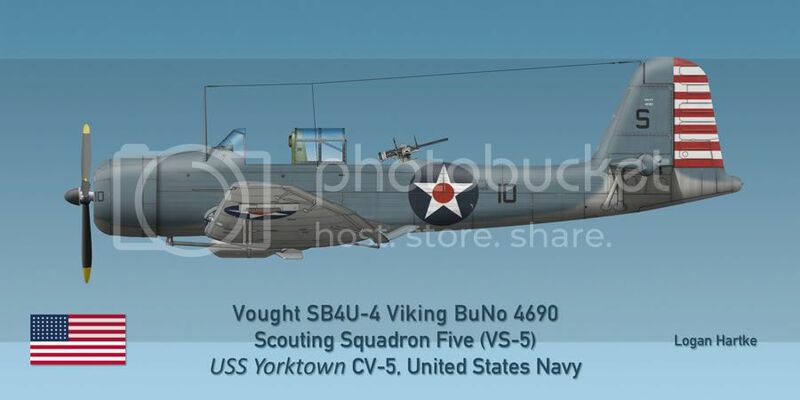 The Vought Viking was closer to the Petlyakov Pe-2, a dive-bomber. Even then, however, the Pe-2 was a much larger and faster aircraft. As a result, the Viking was assigned to units as a replacement to the generally unpopular Sukhoi Su-2. 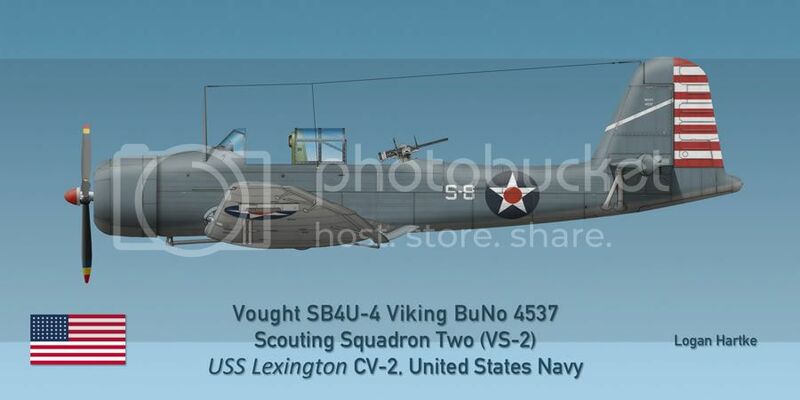 The Viking ended up being a very popular aircraft in the right hands and quickly gained a reputation for being the most accurate bomber in the VVS inventory. It was tough, maneuverable, and long-ranged, the main issue being its dire need for escorting aircraft over the front lines. 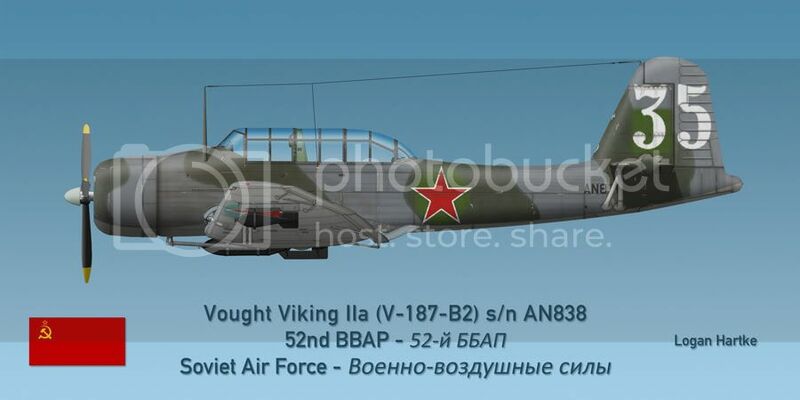 This aircraft is depicted in the colors of the 52nd BBAP (Blizhnebombardirovochniy Aviatsionniy Polk - Short-Range Bomber Air Regiment), the first unit to be fully equipped with the type and to take them into combat. Its bomb racks were modified to take Soviet bombs (seen here with two 50 kg bombs and a single 250 kg bomb), but the standard gun armament remained unchanged. Its original British markings have been crudely overpainted and replaced by the red stars and tactical number on the tail preferred at that time. The unit was originally an Su-2 unit at that time, while the serial number comes from the series assigned to the Vultee Vengeance. The paint scheme is just like the first P-400 Airacobras sent to the Soviet Union in the winter of 1941-42. The most difficult things about this profile were the unique bombs and the unrewarding research on accurate Soviet VVS paint colors. Thanks, Jeremak. I have used Simmers site almost since I started, but the problem with the VVS is that I didn't trust the results of Simmers' advice, so I started looking elsewhere. The problem wasn't that I didn't have enough sources. It was that I had too many...and they all disagreed with each other! THIS was my problem. Eventually, based on the advice of a number of sources, I just went with something based on one of the swatches and modified it slightly. As a few sites said, there were probably a number of variations on them, different manufacturers interpreting AMT-4 different, for example. Heck, they were painting some aircraft in "tractor green", so nobody was going to complain if the RGB values of your camouflage green was "a little off", so there was likely a lot of variation. That radial engined conversion is quite appealing, especially in the Navy color scheme. The problem wasn't that I didn't have enough sources. It was that I had too many...and they all disagreed with each other! I know what you mean: I've touched this during making of WW I profiles: colours from this period is just madness. To say about only one: they can't really get what values give to PC-10! Thanks for all the compliments, everyone! It's great to be back and doing profiles again!